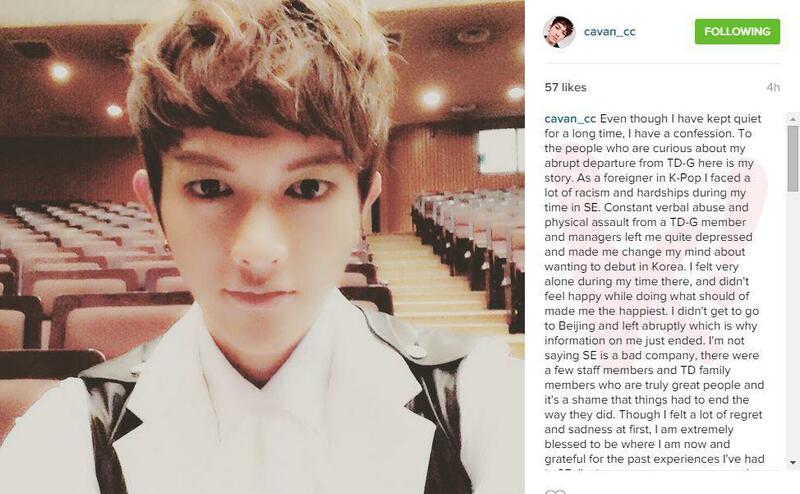 Fans were shocked to hear when Cavan Chen, known under his stage name Leon, from the Topp Dogg sub-unit Under Dogg suddenly left the group. On July 28th, he finally breaks his silence and gives fans an explanation into the situation that eventually led to his decision to leave not only Topp Dogg G (Global) – which combines both Topp Dogg and Under Dogg members for global tours – and Under Dogg – special sub-unit that consists of entirely different members. However, he emphasizes in his explanation, ” I’m not saying SE [Stardom Entertainment] is a bad company, there were a few staff members and TD [Topp Dogg] family members who are truly great people and it’s a shame that things had to end the way they did. Though I felt a lot of regret and sadness at first, I am extremely blessed to be where I am now and grateful for the past experiences I’ve had in SE. I’m in a great company now and I’m working even harder to my dream and future debut. Please support me and also TD in our future activities! #confessions #strongerthanever #practicinghard #화이팅 #잘할거야 #ㅎㅈ“. Cavan Chen has since deleted the post.